Last week’s showcase was the culmination of the Moreton Bay STEM Fest, which involved 240 students from across the Moreton Bay region. They have spent the past two months designing and building their own small robots using LEGO Mindstorms EV3 robotics kits. Eight schools took part – Aspley State High, Bray Park State High, Burpengary State Secondary College, Dakabin State High, Deception Bay State High, Murrumba State Secondary College, North Lakes State College and Pine Rivers State High. The Year 7, 8 and 9 students were helped by QUT, the Queensland STEM Education Network and Step Up during an intriguing STEM (Science, Technology, Engineering and Maths) activity that opened their eyes to new skills and future careers. 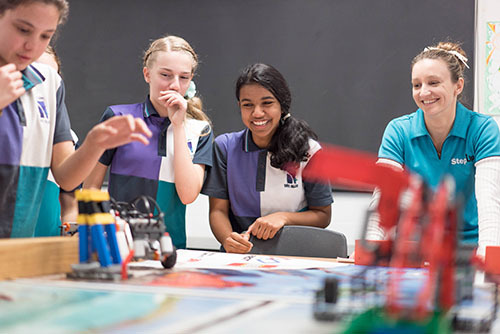 “STEM skills are increasingly critical for students’ job prospects with 75 per cent of the fastest growing occupations in Australia requiring these skills,” said Sharon Cordiner, the Deputy Principal of Murrumba State Secondary College. QUT STEM postgraduate students visited school classroom to help students design and code robots to compete in a series of technical challenges, including navigating courses, moving items and timed races. said QUT education student Suzette Argent (pictured above right, with North Lakes students), who is studying a Graduate Diploma in Education – Biology and is also a Step Up Ambassador. Moreton Bay STEM Fest partners included QUT and its widening participation projects such as Robotics@QUT, the Queensland STEM Education Network, the Australian Government Department of Education and Step Up – a Queensland-wide project, led by QUT, that aims to transform the nature and delivery of pre-service teacher education in the science and mathematics disciplines. This year’s STEM Fest showcase finale coincided with this year’s National Science Week, which had the theme of Drones, Droids and Robots.